New York: 1954, 1954. unbound. 1 page, 10.5 x 7.25 inches, New York, May 24, 1993. 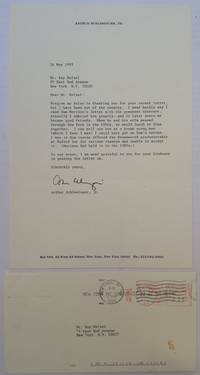 In this letter, Schlesinger responds to a friend who had forwarded him an old, nasty letter about himself, in part: "....I need hardly say I read Sam Morison's letter with the greatest of interest. Actually I admired him greatly, and in later years we became good friends...I can well see how as a brash young man (which I fear I was) I could have got on Sam's nerves. I was in due course offered the Harmsworth professorship at Oxford...but for various reasons was unable to accept it..." The original letter, written by Morison to Winthrop Aldrich, American Ambassador to England, on Harvard College stationery, is included in xeroxed form. In this letter, dated April 20, 1954, Morison gives confidential advice on what candidates should not be considered as applicants for the prestigious Harmsworth Chair at Oxford University, in part: "...Arthur Schlesinger, my colleague here, has become much too controversial a character for a position of this sort. He is one of the leaders of the Americans for Democratic Action...is rather smart-alecky and disagreeable in personality. He is just the kind of person who would rub the English the wrong way..." Near fine condition. In 1954, Arthur Schlesinger, Jr., a professor at Harvard and a close friend of John F. Kennedy, came under fierce attack in the media for being a Communist. It was through the strenuous efforts of Senator Kennedy that the stories finally abated clearing Schlesinger of Communist Party affiliation.